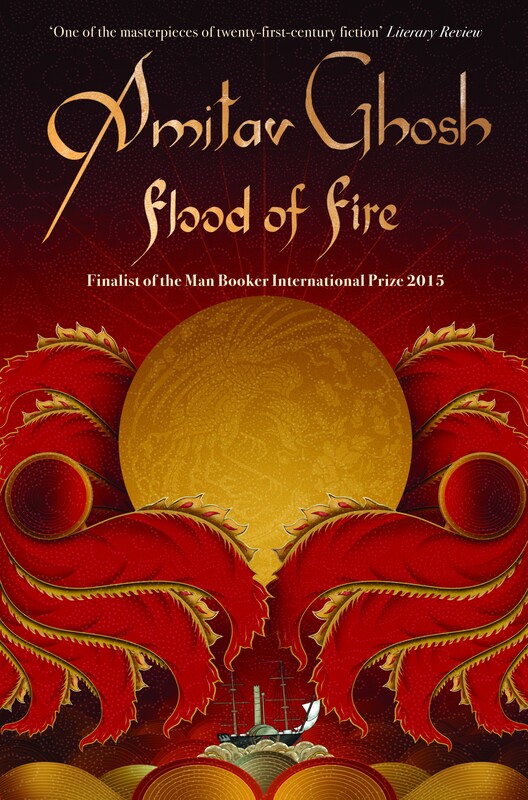 Amitav Ghosh’s Ibis Trilogy has reached a worthy conclusion nearly a decade in the making with its cathartic and heartfelt final volume, Flood of Fire. Ghosh’s trilogy began in 2008 with the thrilling, Booker-prize-shortlisted Sea of Poppies, which trumpeted the arrival of an old-world literary epic. Set in the early 1800s just prior to the start of the First Opium War between the Chinese and the British, Sea of Poppies lays out in glorious mixed-English prose a wide cast of characters as the merchant ship Ibis sets sail for Mauritius. River of Smoke, the trilogy’s second volume, chronicles an incendiary apex of The Opium War as cargo is seized and cannons first fire up the Pearl River. Flood of Fire, the longest volume of the trilogy, sees its cast attempt to regain their footing as the dust settles, unwittingly embroiled in more battles on the horizon. The Ibis Trilogy is a marvel of epic storytelling and does for the Opium Wars what Tolstoy did with the War of 1812 in War and Peace. These two masterworks are remarkably in step with one another, focusing episodically on characters and their growth, all while showcasing a dizzying erudition and intimacy with the era’s history. Ghosh’s characters are 19th-century archetypes, like the young, aspiring sea captain and the ambitious widow determined to make a name for herself in her husband’s absence, but this familiarity allows for a particularly nostalgic, escapist read. With vibrant characters to treat like old friends and acquaintances, Ghosh breathes life into the historical figures that campaign along their side. History is rarely rendered so vibrant in prose. 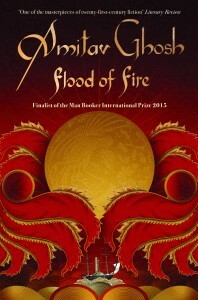 Unlike River of Smoke, which entered the Ibis Trilogy from a different perspective and dramatically expanded the scope of Sea of Poppies, Flood of Fire is a reactionary novel that closely follows the events of its previous volume. In this way, River of Smoke and Flood of Fire feel like two parts of a larger book, with Sea of Poppies functioning as their introduction. Flood of Fire deals with aftermath and the bitter realization of the costs of war. The security of one’s wealth and stature moves to the forefront in Flood of Fire and softly blows the embers with which the novel opened. “Is there really nothing left? Nothing?” asks the newly-widowed Shireen at the start of the novel. “Bahram had left behind nothing but debts. Such were the circumstances that his flagship, the Anahita, had perforce been sold off at Hong Kong, to one Benjamin Burnham an English businessman, for a price far below the vessel’s value.” Shireen is at a loss after her husband’s death and the liquidation of his assets, but feels “money is only one small part of the problem. I have to consider my family’s name a reputation.” Flood of Fire splits into two prevalent threads with the sale of the Anahita; one follows Shireen in her endeavors to build a name of her own while the other moves towards Benjamin Burnham, who has recently employed the ambitious, young Zachary Reid. Zachary is “sick of sailing, risking your life every day, never having any money in your pocket.” “I don’t want to be one of the deserving poor any more,” he exclaims, “I want to be rich, Baboo; I want to have silk sheets and soft pillows and fine food… I want to own ships and not work on them… I want to live in Mr. Burnham’s world.” While fueled with different sorts of ambition, both Zachary and Shireen journey towards the epicenter of the Opium Wars and strive, against all odds, to become something great. Despite opening in a moment of calm, the political turmoil in Flood of Fire is far from over. Although Britain’s show of force at the end of River of Smoke was a political success, the British twist the knife in Flood of Fire and demand economic remuneration from China as well: “along with many other demands the British had asked for a sum of six million Spanish dollars in compensation for the opium that Commisioner Lin had confiscated the year before. In addition they had demanded that an island be ceded to them, as a trading base.” These conditions spark an explosive third act as Ghosh’s many threads reconvene for a blazing finale. Readers of the trilogy will recall Zachary’s secret past as a mixed-race but fair-skinned son of a slave, and marvel as that history vanishes in the face of shared ambition. Not only does Ghosh write with such skill that readers will feel this excitement as Zachary does, he does so in a way that resonates centuries beyond his novel’s setting into our present day. Amitav Ghosh reminds us that there was a time when one could dream, stow away on a ship and set sail to the great unknown regardless of our pasts, and that there was a time when a great adventure novel was the next best option.